Janod splash 2 in 1 convertible desk doubles your child’s creative possibilities! 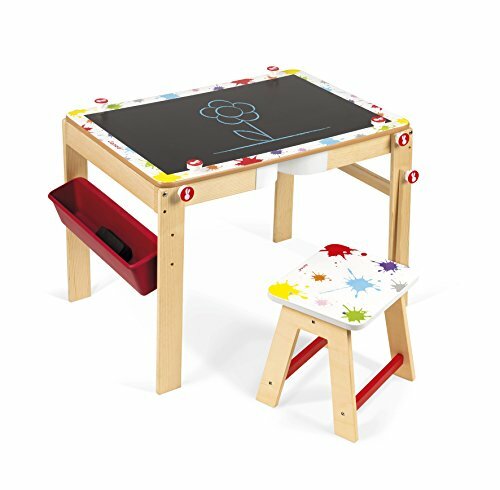 whether they prefer creating masterpieces sitting at a desk or standing at an easel, this convertible creation station has them covered. The 30in. X 20.5in. X 20in. (76.5 x 52 x 51.5 cm) desk, with a few twists and flips becomes a 20.5in. X 19in. X 45.5in. (52 x 48.5 x 116 cm) free standing easel. Each has 2-sided magnetic surfaces to feature a chalk board or a dry erase board. Bright bursts of color on the border gives the board a fun and artistic look that match other products in the Janod splash line. Kids can use chalk, magnets or dry-erase markers to express themselves. Includes a convertible desk, plastic storage bin, chalk pen, dry erase pen and eraser. Recommended for children 3 years of age and older.